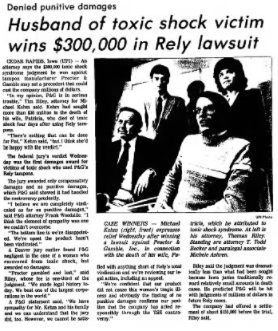 “Denied Punitive Damages: Husband of Toxic Shock Victim Wins $300,000 in Rely Lawsuit”, The Salina Journal, April 22, 1982. The technological fix meant to help women seamlessly manage, and thus hide menstruation, had fatal consequences. Rely tampons were linked to the deaths of 38 women from Toxic Shock Syndrome. In 1982, TSS was still the subject of news coverage and legal battles. The most notable of these court cases was Kehm v. Procter and Gamble. Kehm died of TSS after using Rely tampons. In April 1982, a federal jury found Procter and Gamble liable in the death of Patricia Kehm. Procter and Gamble played $300,000 in damages to her husband. At that time, 400 other suits related to TSS were pending against P&G.